I rather like Google+. I like that it can be one place for me to share content with friends, digital marketing industry folks (helllo) and my geeky gamer friends without having to cross the streams and bother people with off topic twaddle. I also like the people search functionality. I know it's new and a proper search for Google+ is needed but I've found that where I might have previously gone to LinkedIn to try and find someone I've started to go to Google+. This morning I wanted some insight on whether I should describe Matt Cutts as Google's "Head of Spam" or "Head of Web Spam" and hit up Google+. 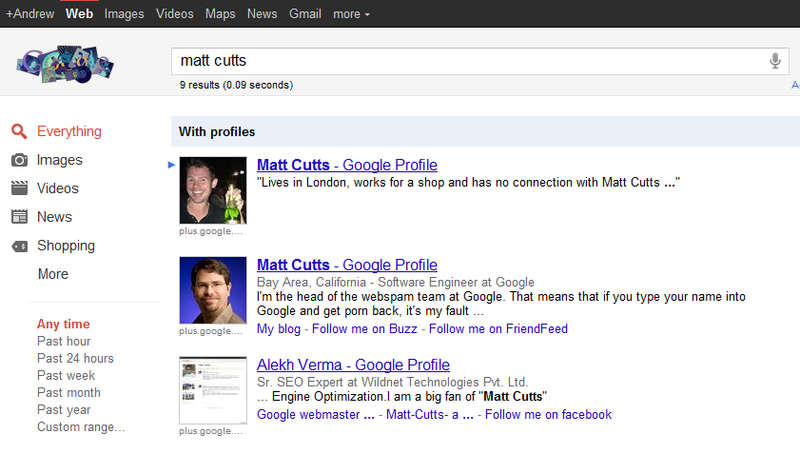 He's not the number #1 Matt Cutts in Google+. You would have thought that with all the early adopters currently in the system he'd be the most popular, influential and connected Matt Cutts. Maybe he is. 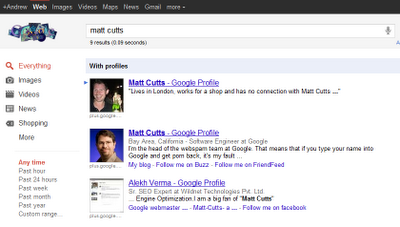 The actual #1 Matt Cutts is a chap from London who's profile already seems to be on the defensive. This is just a snapshot illustration of a beta product but it does indicate that 'people ranking' is going to be an interesting challenge. Connections and closeness is are two of the more obvious quality signals that Google might look at here - as might be recent activity. I can also see Google looking at who authored content someone's recently read and using that as a factor into working out who someone might be searching for.